The Sin Committee is a Dutch metal band that brings a strong variety of influences to their progressive metal. Their second EP, Confess, is hardly extreme progressive metal but it's not your standard fare either. The music is heavy, technical, and generally melodic enveloping movements of thrash, death metal and metalcore. It sounds eclectic, but for the most part it works: Confess is genuinely intriguing and entertaining. However, at times it feels at bit inconsistent. The beginning cut, Confess, as introduction is interesting, but hardly compelling. Within, we're introduced to their use of clean and death vocals for the first time; something that diminishes Confess like an infestation of ants at a picnic. Frankly, I don't think Joris Bod can sing very well to begin with, and the growling vocals simply over compensate for it. Fortunately, Confess steadily improves from here, excepting the vocal performance. Serious Adverse Event is technical, heavy and melodic showing The Sin Committee to be much more accessible. Straw Man has a fast, thrash melodic death metal movemnt overall, but segues about three minutes in with an impressive mixture of vocals (surprisingly better), guitar and symphonic arrangment. Without doubt, he highlight of Confess is the final, Four 2 One. Here TSC displays their best musicianship and innovation by blending modern prog conventions with some old school metal (you might even here a bit of early Metallica within). The Sin Committee's second EP Confess is an original foray into unconvential progressive metal. Though leaning heavily on modern trends, they are still able to apply innovation and melody to their arrangements for a satisfying result. If they can overcome the weakness in their vocal performance, future development and success will be noteworthy. 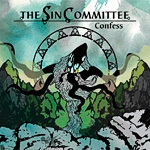 The Sin Committee's second EP Confess is an original foray into unconvential progressive metal. Though leaning heavily on modern trends, they are still able to apply innovation and melody to their arrangements for a satisfying result.